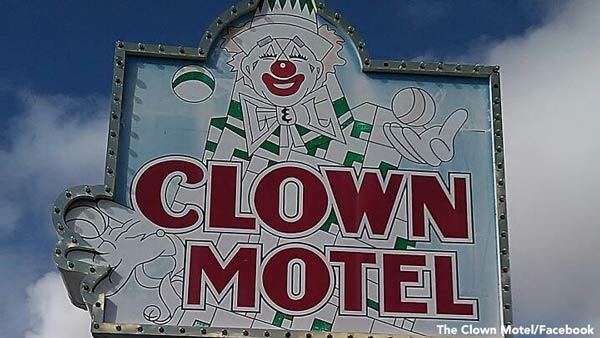 TONOPAH, Nev. -- A clown-themed motel next to a reportedly haunted cemetery is going up for sale in rural Nevada, with the owner insisting the 600 clown figurines, mannequins and paintings, and his employees, get to stay. After 22 years, the Clown Motel owner Bob Perchetti says it is time to find someone else to look after the clown figurines, mannequins and paintings spread throughout the building in Tonopah, about 250 miles northwest of Las Vegas. The 79-year-old Perchetti said he is ready to "enjoy some free time" with his wife, five daughters, three sons and 14 grandchildren. Perchetti said he hopes to sell the motel in a month, but he is insistent the clowns stay. "I'm not going to let them change the clown motif," he said. "That's going to be part of the contract." The motel was built around 1985 by siblings Leona and LeRoy David, Perchetti said. LeRoy David already owned the L and L Motel in town, but wanted to build another next to the cemetery where his father was buried. The two thought it was the perfect place to house their small clown collection. "He and his sister decided from day one that it was going to be the Clown Motel," Perchetti said. Perchetti bought the motel from the David siblings in 1995. The motel got a major boost in 2015 when it was featured in an episode of the TV show "Ghost Adventures." Viewers saw blurry footage of a life-sized clown mannequin sitting by the front desk. The mannequin's hand moved on its own. "After that was when we started getting a lot more activity," Perchetti said. "A lot more people stopping." Donations poured in. Clown figurines from Europe, Asia, Australia and New Zealand joined the collection. The motel draws its employees - about seven consistent part-time workers - from Tonopah, the Las Vegas Review-Journal reports. Some are locals, but others are outsiders who rolled into town without a place to stay, like Marlena Dufour. Dufour, who was looking for work, was on her way from Texas to Sacramento, California, when her car broke down near the motel. Perchetti offered her work managing laundry in exchange for a room. She secured her night shift at the motel in 2010, working for $8.25 an hour. And she's still in Tonopah. "If it wasn't for Bob, I don't know where we would have been," she said. Employees who have been at the motel longer are afraid of losing work in a town where work is hard to come by. "We're afraid that our jobs are going to end," Dufour said, her voice cracking, before adding that she hopes she and her colleagues' work ethic is enough for the future owner. Perchetti said he wants the new owner to at least interview his current employees so they can keep their jobs. Perchetti said he's already had more than seven offers to buy the building. "They can improve it any way they want, but we don't want to lose the clown motel," he said. "We want it to be bigger and better."